The All Tenants view provides a global view of all Avi Vantage objects across all tenants. This includes all the tenants, including the admin tenant. The All Tenants view is intended for viewing, updating, and deleting objects. New objects cannot be created in this view. Note: The All Tenants view is supported only for administrative user accounts configured to be superuser. To use the feature, you must log in with an Avi Vantage user account that has the role System-Admin and the superuser attribute enabled. To switch the focus of the management session to the All Tenants view, use any of the following methods. 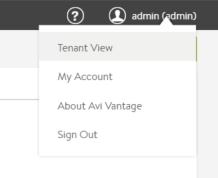 From Avi Vantage UI, navigate to the user administration menu and select Tenant View. 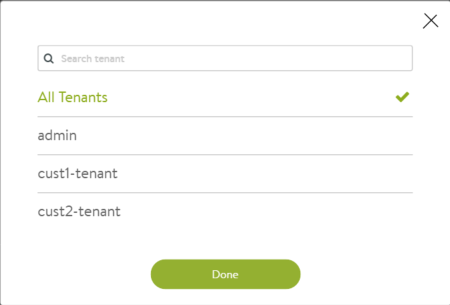 Specifying /* (wildcard) instead of a tenant name gives access to objects across all tenants. Set the value of X-Avi-Tenant in the HTTP request header to /* (wildcard).